Over the past century, explosive demolition has grown from an uncommon experimental procedure into an industry that successfully performs hundreds of projects each year. However, despite the large number of these events worldwide, the vast majority of the general public has still never seen an implosion first-hand. Which is why we developed Implosion Live. The webcasts archived below are designed to bring you, the viewer, on location to experience the final minutes leading up to a blast in real time. And you're not just standing with the other spectators-- you're watching alongside part of the demolition team. Sometimes we will speak with the blaster during the countdown. Other times we may chat with the general demolition contractor, or a resident whose house is closest to the implosion, or we'll actually travel inside the doomed building to show you what types of explosives and methods the blaster is using to fell the structure. As you'll see, each webcast is different-- and a little unpredictable-- because you never know exactly what will happen when watching an Implosion Live. These events are designed for viewing with the RealPlayer system. Click here to install a free version of RealPlayer, or call 1-888-NETCAST for further assistance. Ever wonder what a blaster experiences during the final countdown to detonation? Protec's 12-minute webcast of the 10-story Delaware Trust Building implosion in downtown Wilmington USA will show you, as cameras silently track Demtech's Steve Rainwater during the final minutes leading up to his blast. Documentary aficionados take note; there's no hype, no spin, and no preening for film crews. Just a unique behind-the-scenes look at the conversations and events that precede a typical urban building implosion. This webcast is not currently available. Please check back. Residents of Baltimore, Maryland recently witnessed the tallest and most difficult building implosion in their city's history with the felling of the 20-story Hollander Ridge Tower. Blaster Jim Redyke of Dykon Explosive Services takes a few minutes to explain some of the intricacies involved with this project during Protec's 9-minute webcast, which climaxes with five angles of the actual implosion. It's not often that one gets to see over 400 shape charges firing simultaneously, but such was the case recently in Ford City, Pennsylvania as Joseph B. Fay Co. and Demtech teamed up to demolish Veterans Bridge over the Allegheny River. The 940-foot span was brought down in two phases, and the second, 670-foot phase was webcast live through a collaborative effort between Protec and Ford City's business-renewal website, smalltown2000.com. Aside from the unusually high number of explosive charges, this event was notable for two reasons: It was the first live webcast of a bridge blast, and it was the first 'plunger-push' to be auctioned on the internet (A local resident bid $1,425.00 on ebay for the ceremonial honors). This 20-minute webcast is hosted by Mike Grimes from Smalltown2000, and features occasional commentary from Protec representatives working on-site. Protec cameras recently traveled to the town of Dundee, Scotland, where Safedem Ltd. and Controlled Demolition Group successfully felled two 15-story structures known as the Harefield Kilspindie Towers. This 10-minute webcast features an on-site interview with William Sinclair, president of Safedem, who discusses the many challenges his team faced while working in this historic, structurally-congested area. Blasting Firm: Jowenko/Uittenboogaard & Zn V.O.F. 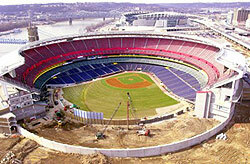 In demolition circles, March 2000 will be best remembered for the much-ballyhooed Kingdome implosion in Seattle. However few people are aware that just two days earlier, a small demolition project nestled between 1600's-era buildings in the heart of one of America's most historic towns took its rightful place as the month's riskiest and most successful blast. 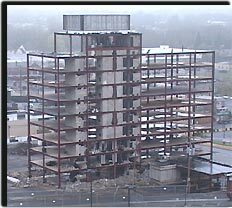 Protec's 9-minute webcast from New Hope, PA includes seven angles of the delicate destruction as well as a post-blast interview with blaster Scott Gustafson of Demtech, Inc.
On February 20th, 2000 Controlled Demolition Group from Yorkshire, England successfully demolished the 19-story Barkway Homes tower block in London. This 9-minute webcast features an on-site interview with blaster Charles Moran just minutes before the detonation, and provides five dramatic views of the event. It all started here in Philadelphia, Pennsylvania. On October 20, 1999 Bianchi Trison Corp. and the Philadelphia Housing Authority teamed with Protec to produce the first-ever live implosion webcast. Beyond just showing the actual implosion, the program captured several unanticipated moments, such as a dense fog that rolled in minutes before detonation and police 'politely' removing several people who refused to leave the secure zone. The MLK webcast was viewed in 11 countries and met with critical acclaim from industry experts worldwide. To view Protec's 40-minute program of the event, click on one of the modem speeds below. updates and future live events.